No mouse! 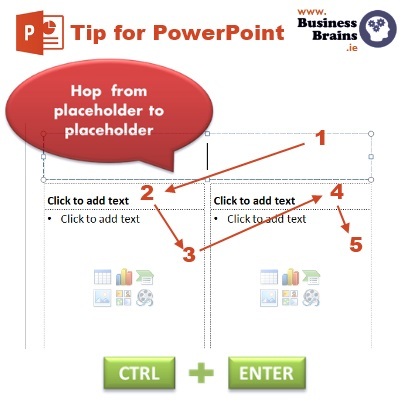 Need to edit or review PowerPoint slides? Press CTRL+ENTER to move from placeholder to placeholder. When you reach the last placeholder, press CTRL+ENTER to create a new slide. This magic trick is particulary useful when worky with those busy slides with multiple pictures, charts, drawings where clicking the right object can get tricky. Working with the Selection Pane and visibility options can also prove a real time-saver. Have you tried this yet? Go on, open up PowerPoint.